Cesária Évora (Portuguese pronunciation: [sɨˈzaɾiɐ ˈɛvuɾɐ]; 27 August 1941 – 17 December 2011) was a Cape Verdean popular singer. Nicknamed the "Barefoot Diva" for performing without shoes, she was also known as the "Queen of Morna". "Cise" (as she was known to friends) was born on 27 August 1941 in Mindelo, São Vicente, Cape Verde. When she was seven years old her father, who was a part-time musician, died, and at the age of ten she was placed in an orphanage, as her mother could not raise all six children. At the age of 16, she was persuaded by a friend to sing in a sailors' tavern. In the 1960s, she started singing on Portuguese cruise ships stopping at Mindelo as well as on the local radio. It was only in 1985 when at the invitation of Cape Verdean singer Bana she went to perform in Portugal. In Lisbon she was discovered by the producer José da Silva and invited to record in Paris. Évora's international success came only in 1988 with the release of her first commercial album La Diva Aux Pieds Nus, recorded in France. Prior to the release of the La Diva Aux Pieds Nus album, Cesaria recorded her first LP titled "Cesaria" in 1987. This Album was later released on CD in 1995 as Audiophile Legends. Her 1992 album Miss Perfumado sold over 300,000 copies worldwide. It included one of her most celebrated songs, "Sodade". The house of Cesária Évora. Her 1995 album Cesária brought her broader international success and the first Grammy Award nomination. In 1997, she won KORA All African Music Awards in three categories: "Best Artist of West Africa", "Best Album" and "Merit of the Jury". In 2003, her album Voz d'Amor was awarded a Grammy in the World music category. In 2006 in Italy Cesaria met Alberto Zeppieri (songwriter, journalist and record producer), who would dedicate to her "Capo Verde, terra d'amore" (www.capoverde-italia.it), taking care of all creative adaptations in Italian. Cesaria agreed to duet with Gianni Morandi , Gigi D'Alessio and Ron . The project, now in its fifth volume, gives visibility and raises funds for the UN World Food Programme, for which Cesaria was the Ambassador from 2003. In 2010, Évora performed a series of concerts, the last of which was in Lisbon on 8 May. Two days later, after a heart attack, she was operated on at a hospital in Paris. On the morning of 11 May 2010 she was taken off artificial pulmonary ventilation, and on 16 May she was discharged from the intensive-care unit and transported to a clinic for further treatment. In late September 2011, Évora's agent announced that she was ending her career due to poor health. On 17 December 2011, aged 70, Évora died in São Vicente, Cape Verde, from respiratory failure and hypertension. A Spanish newspaper reported that 36 hours before her death she was still receiving people – and smoking – in her home in Mindelo, popular for always having its doors open. On 3 September 2013, her name was boosted publicly by the Belgian musician Stromae, when he released his famous album Racine Carrée that includes "Ave Cesaria", a track that honours Cesária Évora, one of Stromae's favourite artists. On December 22, 2014, the Banco de Cabo Verde introduced a new series of banknotes that honor Cape Verdean figures in the fields of literature, music, and politics. Her face was featured in the new 2000 Escudos banknote. On March 8, 2012, Cape Verde's third busiest airport was named after her. "Nha Cancera Ka Tem Medida"
↑ Werb, Jessica (24 March 2006). "The Barefoot Diva on her best behaviour". The Globe and Mail. Retrieved 21 March 2015. 1 2 3 4 5 "Grammy-winning singer Cesaria Evora dies at age 70". The Washingtion Times. Retrieved 23 October 2014. ↑ "Cesaria Evora: Cape Verde's soulful 'barefoot diva'". The Independent. Retrieved 23 October 2014. ↑ Garth Cartwright: Cesária Évora obituary in The Guardian, 17 December 2011. ↑ "BBC News - Singer Cesaria Evora dies at the age of 70". BBC News. Retrieved 23 October 2014. ↑ "Capo Verde terra d'amore". www.capoverde-italia.it. Retrieved 2015-09-13. ↑ "Cesaria Evora termina a carreira aos 70" (in Portuguese). Publico.pt. Retrieved 24 September 2011. ↑ "Evora leaving forever". Rt.com. Retrieved 17 December 2011. ↑ "Las últimas palabras de Césaria/Cesária's last words". Publico.es. Retrieved 17 December 2011. 1 2 3 4 "Les Charts". Lescharts.com. Retrieved 23 October 2014. 1 2 "Portuguese Charts". Portuguesecharts.com. Retrieved 23 October 2014. 1 2 3 "Belgium Charts (French)". Ultratop.be. Retrieved 23 October 2014. 1 2 "Belgium Charts (Flemish)". Ultratop.be. Retrieved 23 October 2014. 1 2 "Finnish Charts". Finnishcharts.com. Archived from the original on 24 October 2014. Retrieved 23 October 2014. 1 2 "The Official Schweizer Hit Parade". Hitparade.ch. Retrieved 23 October 2014. 1 2 "Dutch Charts". Dutchcharts.nl. Retrieved 23 October 2014. 1 2 3 "Olis : Polish Chart". Olis.onyx.pl. Retrieved 23 October 2014. ↑ "Cesária Évora". Billboard.com. Retrieved 23 October 2014. ↑ "iTunes - Music - La diva aux pieds nus by Césaria Évora". iTunes. Retrieved 23 October 2014. ↑ "iTunes - Music - Distino Di Belita by Césaria Évora". iTunes. Retrieved 23 October 2014. ↑ "iTunes - Music - Mar Azul by Césaria Évora". iTunes. Retrieved 23 October 2014. ↑ "iTunes - Music - Miss Perfumado by Césaria Évora". iTunes. Retrieved 23 October 2014. ↑ "CESARIA EVORA : The best Capevrerdean Singer". Caboverde.com. Retrieved 23 October 2014. 1 2 3 4 5 6 7 8 "Albums - SNEP". SNEP. Retrieved 23 October 2014. ↑ "iTunes - Music - Cesaria by Césaria Évora". iTunes. Retrieved 23 October 2014. ↑ "iTunes - Music - Cabo Verde by Césaria Évora". iTunes. Retrieved 23 October 2014. ↑ "iTunes - Music - Café Atlantico by Césaria Évora". iTunes. Retrieved 23 October 2014. ↑ "Cesaria Evora : Biography". Rfmusique.com. Retrieved 23 October 2014. ↑ "Golden - Platinum". Web.archive.org. Archived from the original on 2 August 2003. Retrieved 23 October 2014. 1 2 3 4 5 "ZPAV :: Bestsellery i wyróżnienia - Strona główna". Zpav.pl. Archived from the original on 14 October 2013. Retrieved 23 October 2014. ↑ "iTunes - Music - Sao Vicente by Césaria Évora". iTunes. Retrieved 23 October 2014. ↑ "iTunes - Music - Voz d'Amor by Césaria Évora". iTunes. Retrieved 23 October 2014. 1 2 3 4 "ZPAV :: Bestsellery i wyróżnienia - Strona główna". Zpav.pl. Archived from the original on 14 July 2014. Retrieved 23 October 2014. ↑ "iTunes - Music - Rogamar by Césaria Évora". iTunes. Retrieved 23 October 2014. ↑ "iTunes - Music - Nha Sentimento by Césaria Évora". iTunes. Retrieved 23 October 2014. ↑ "ZPAV :: Bestsellery i wyróżnienia - Strona główna". Zpav.pl. Archived from the original on 18 August 2014. Retrieved 23 October 2014. ↑ "iTunes - Music - Cesaria Evora & ... by Césaria Évora". iTunes. Retrieved 23 October 2014. ↑ "iTunes - Music - Mãe Carinhosa by Césaria Évora". iTunes. Retrieved 23 October 2014. ↑ "iTunes - Music - Radio Mindelo by Césaria Évora". iTunes. Retrieved 23 October 2014. 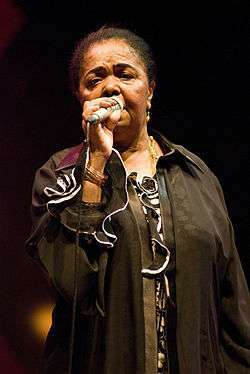 Wikimedia Commons has media related to Cesária Évora.